This place is amazing. Sky Hawk Ridge is a 185-acre refuge at the gateway to Buffalo River National Park. Two vacation homes are now available: a 2 BR, 2 bath ranch house and a new 3 BR, 2 bath forest home. Two more new cabins will be constructed in 2019. Houses are far apart, so there's plenty of privacy for each of our guests. Sky Hawk is located just off US Hwy. 65 on the north side of the river. Restaurants, canoe rentals and river access points at Grinders Ferry, Gilbert and Tyler Bend are just minutes away but at Sky Hawk you're secluded and surrounded by natural beauty -- away from it all. When you walk along Sky Hawk's hilltop setting, there is beauty all around. You see across the Buffalo River Valley to layered green hillsides and distant blue ridge lines. To the north you see rolling meadows with sentinel oaks, cattle grazing in lush pastures, and Pilot Mountain in the background. The entrance to Sky Hawk is on Gilbert Road (Hwy. 333), only 4/10 mile east of US 65. Enter the property past the split rail fence on the right. A half-mile lane to the house passes through dense woods, past a beautiful wetland meadow, and the new house in the woods below, then breaks through the tree line to reveal a long open hilltop accented by grand old oaks. Around a bend and past an old red barn, you come to the ranch house, flanked by wide, open porches front and back. Built in 2008 as a family vacation home, the ranch house at Sky Hawk Ridge is newly offered for nightly guest rental. With over 1500 square feet of living area, the house is spacious, warm and inviting ... perfect for families. It has a huge, vaulted great room and two roomy bedroom suites, each with its own full bath. You'll sleep well on comfortable beds with crisp, cotton sheets. There's a king bed in the master with a thick, pillow-top mattress, and two full beds in the guest bedroom with sumptuous memory-foam mattresses. A new sofa bed in the living room with a queen memory-foam mattress will comfortably sleep two. The house is equipped with a washer and dryer, a full kitchen with appliances (no dishwasher), cooking utensils and dishes, central heat and air conditioning, ceiling fans, and a small gas fireplace in the living room for extra warmth on cold nights. Satellite TV, Wi-Fi and DVD players are available for guests. The home is a perfect gathering place for family and friends. Sofas and chairs in the living room provide comfortable seating for eight people. An expandable dining room table seats six, and bar stools around a large kitchen island seat four more. Relax outside on rocking chairs on the front porch or a porch swing in back. When you stay at Sky Hawk Ridge, you won't stay inside for long. Roam the land and discover the wonders of this beautiful place. Enjoy misty morning walks through dew-covered meadows. Watch gorgeous sunsets over Ozark Mountains. Explore miles of well-maintained private trails that wind through dense forests and beside crystal streams. Wildlife is everywhere -- deer, turkey, fox, owls, songbirds, and all sorts of woodland creatures. Be dazzled by spring flowers, beautiful summer skies, rich fall colors, or foggy winter mornings. Sky Hawk is a nature-lover's paradise. The property has 3/4 mile of park frontage and the Buffalo River Trail is just steps away from the property corner. The trail leads east to the town of Gilbert along high bluffs above the river valley, or down to the west to a wide gravel bar across from Shine Eye Bluff -- a perfect spot to picnic, swim, fish and enjoy a lazy afternoon. 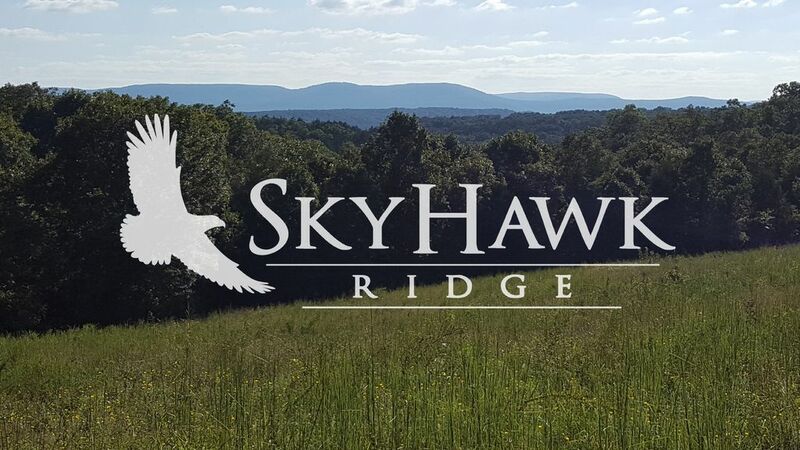 Sky Hawk Ridge has the finest vacation home rentals anywhere near the gateway to Buffalo River National Park. You'll leave with lasting memories of your stay at this incredibly beautiful private retreat. Call us today for more information. toilet, combination tub/shower, Washer and dryer located in this bathroom. 185 acres of woods and meadows. A private retreat. Hilltop views of the Buffalo River Valley. Good cell phone service for most carriers. Outdoor fire pit behind the house. Firewood provided. Bathroom towels are provided. Please bring your own towels for the river. Comfortable couches, large chairs and leather chair. TV with DVD player. Keurig and drip coffeemakers are provided. Expandable dining table seats 6 plus 4 bar stools at the kitchen island. DVD players in living room and south bedroom. Guide books for Buffalo River area. Canoe & Kayak rental services and river access points very close by. Large covered porches, front and back. Rocking chairs and porch swing for outdoor relaxation. World-class golf courses in Branson, MO 50 miles north. No smoking inside. Smoker's Pole on Deck. Sky Hawk Ridge is a wonderful venue for weddings and family reunions. Call for details. This was the perfect retreat for our little family. The property is absolutely stunning and the house has everything you could possibly need. Thank you again for another amazing vacation (yes this is our 2nd time to stay here). Great location, great property, and very welcoming owners. I would definitely recommend this property. We really enjoyed our morning hike around the p180 acres. Thanks so much. Wonderful. The house is rustic ranch house in appearance and has very modern facilities and appliances. It is beautifully decorated in a southwest motif and is very relaxed in atmosphere. It was extremely clean. The property is very well maintained and is to die for. Quiet. Sceanic. Beautiful. The beds and furniture are very comfortable. Sky Hawk far exceeded my expectations. My wife and I will make a return visit. Really really really nice. We love our times spent at the cabin. This trip was enhanced by the abundance of deer on the property. The new hiking trails are a nice feature as well. If I could imagine my ideal retirement location, this nailed it! Perfect for a family get away. I took my family of 5 (plus our Labrador) to escape the busyness of life. Very easy to get to really and in close proximity to the Buffalo river. Driving up, the front fence / sign was a give away that the property would be top notch. Driving down the gravel / grass road spooked a few deer herds which the kids loved to see the scattering white tails. Past the newly built cabin (#2), the road wound past a work barn / shed and a few hay field. The cabin was perfect with a great living / dining space. The bedroom setup was nice as well. Everything you could imagine was in the kitchen. I’m not sure what is supposed to be stocked, but it was like I pulled into home... I enjoyed waking up early and sitting on the large porch, just listening to nature wake up. Our family stayed 10 days at SkyHawk Ridge. If you are looking for peace and quiet this is the place! My husband is an avid motorcycle rider and wanted to ride the Ozarks, the property is central to many good riding roads for a bike rider. I, on the other hand, was looking for a quiet get away and SkyHawk Ridge was perfect for both of us! Our dog, Annie and I would sit on the porch and watch the wildlife in the fields surrounding the house. It was the most relaxing vacation ever. The owners were great to deal with and the property managers were always available and eager to make our vacation perfect. Thank you Lori and Frank for sharing your little piece of heaven with us and Donna and Ron for making our stay very memorable. We will return again soon. Sky Hawk Ridge is at the center of activity for the middle section of the Buffalo River, the most popular and scenic part of the river where water levels are floatable all year long. Tyler Bend Visitor Center is just across the bridge; the town of Gilbert is right down the road. Nearby Ferguson's Restaurant, Big Springs Cafe and Coursey's serve delicious home-cooked meals. Spend your days floating the river and marvel at the spectacular bluffs along the way. Fish, swim and picnic on clean, wide gravel bars. Hike or horseback ride on miles of trails through the park. One of the nicest sand and gravel bars on the river that is easily accessible by car is across from Shine Eye Bluff, just below the property. The access road is on the east side of US 65, just north of the bridge. It's a great spot for a family picnic and an afternoon of fishing, swimming and enjoying the beauty of the Buffalo River. There is public parking, a restroom, and a picnic table available. On a rainy day, take a road trip to Leslie, Arkansas to explore antique shops and artist galleries or dine in charming downtown cafes. Take a day for a scenic drive around the upper river where you will enjoy sweeping mountain vistas, beautiful countryside, and historic Ozark towns along the way. Or drive 55 miles north to Branson for a day of shopping, fun and entertainment, then escape the crowds at the end of a fun-filled day to return home to your cozy mountain hideaway. You can vacation for a week or more at Sky Hawk and never run out of fun and interesting things to do. 1. Daily rates are based on 6 guests. 2. For additional guests, add $20.00 plus tax /person/night. 3. Pet fee $20.00 per night plus tax. 4. Maximum 8 guests, 2 dogs. 5. Daily rates are based on min. 2-night stay. 6. Add $25.00 for 1-night stay (Sunday-Thursday nights only). Sky Hawk Ridge is in a dry county. The closest liquor store is 18 miles north.